For catering the variegated needs of our clients, we are deeply engrossed in offering a qualitative array of Brass Forged Parts. Being a leader in the industry, we are engaged in offering a qualitative range of Brass Forging Parts to our clients. 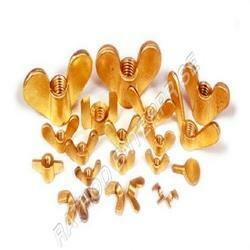 We are leading manufacturer, supplier and exporter of brass forging parts as per drawing and customer's specification. -The prices mentioned are just our approximate starting range prices .Actual price may vary depending upon your order type and quality . Material : IS 319 Brass Free Cutting. As per BS-249 Free Cutting Brass Material. Any Special Brass Material Composition on Request. Aimed at prosperous growth in this domain, we are instrumental in manufacturing an excellent quality range of Brass Precision Forging Parts. We are successfully engaged in providing a wide gamut of Brass Forgings. With our vast experience knowledge in this field, we are engaged in providing a quality-assured range of Brass Forged Parts. 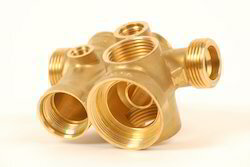 We are offering wide range of Brass Forging Parts for Construction Fittings. Backed by rich industry experience, we are engaged in manufacturing a premium quality range of Brass Forging Part. Well threaded Price : Approx 400 Rs to 1000 Rs per kilogram as per quality and size. Custom manufacturer of forgings made from alloy steel, aluminum, nickel & nickel alloy and brass & bronze. Capable of handling parts up to 24 in. We offer high quality of Brass Contacts Forged/Pressed/Machined. Being a foremost organization in this industry, we are actively engaged in offering the finest quality range of Brass Forging Body. We are remarkable entity in this domain, engaged in manufacturing, trading, importing and exporting a wide array of Brass Precision Forging Parts. - Widely used in automobile applications. We are a leading manufacturer and exporter of comprehensive range of Brass forgings, which are made from one of the most superior grade brass. With our years of experience & in-depth knowledge in this field, we are engaged in offering a quality-assured array of Brass Forging Parts. - Commonly used in mechanical, electrical, automobile and other related industries. We offer premium Brass Forgings that are highly appreciated in the markets. Our Brass Forgings are manufactured from the finest brass as per the national and international quality standards. Widely used in various sectors, our Brass Forgings are durable as well as efficient. - Used in mechanical, electrical, automobile and other related industries.